adds a whole new dimension to your sales event! 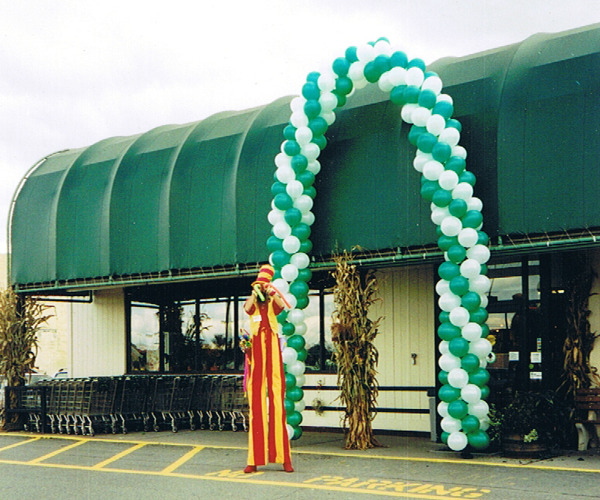 Indoors or outdoors, a professional stiltwalker always adds that extra festive flair to your promotional event. Plus, TREVOR's striking color scheme automatically draws everyone's eyes towards your establishment. Everyone notices your business when there's a stiltwalker in front of your place! Standing over 9' tall in front of your location, TREVOR draws everyone's attention in your direction. As he is waving at everyone, every single driver and every single pedestrian takes a look to see what's going on! Cars slow down. Drivers honk. Passengers and pedestrians alike break into big smiles. Lots of thumbs up. Lots of "Bravo's!" Lots of cheers. 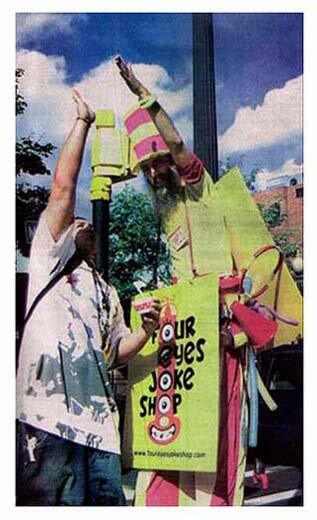 Pedestrians are always thrilled to give a really High Five. And a whole lot of attention is drawn to your business and to your event. If you have a specific promotion, a free give away, or a raffle to sign up for indoors, he will talk that up out front, too, to pull even more customers inside. As you can see from the photo at right, TREVOR can also wear a sandwich board so potential customers will see your business name, your special offer, or what the event is all about before even entering your establishment. For indoor promotions, depending on the specific space and your preferences, TREVOR can stand outside your entrance and encourage potential customers to come inside, stand just inside and greet your customers as they come in, and/or rove throughout your entire business and interact with people who are already there. Your customers will be smiling as they first catch sight of TREVOR outside or when they walk in the door and move through the aisles. And everyone knows happy customers buy more!